Sibelians who have not already unearthed these treasures need to seek them out. The sound is no great shakes though very decently presented here and the music making has an astonishing grip. 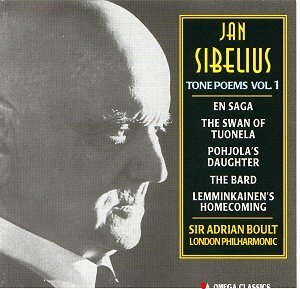 You may not associate Boult (with his classic buttoned-up image) with Sibelius. However this is Sibelius impatient and furious, dangerous and tetchy. There is not a shred of a hint of emotional constipation in these performances. You can see now where the success of Boult's Lyrita recording of the Moeran came from. This most Sibelian of British symphonies was given a roistering, stomping performance with the 'New Philharmonia of London' 20 years after these Sibelius recordings were made one dusty summer in a London heatwave. Incidentally when can we expect that particular diamond from the Lyrita treasury to be reissued on CD? I have no recollection of Boult conducting Sibelius symphonies but he must have done at some stage perhaps during his BBC years. If you check the archives you will find that he recorded The Oceanides and Nightride and Sunrise on 78s in the 1930s and these were incorporated in the Sibelius Society albums. (Why has no-one thought to reissue those versions I wonder?). The build-up and the first 12 or so minutes of En Saga hold you in breathless concentration. The tension relaxes somewhat towards the end. The Boult is every bit the equal in interpretative values of the Horst Stein/Suisse Romande Decca recording from the late 1970s. The famous Swan has all the requisite poise and again that very concentration we associate with Mravinsky! Note the honeyed control of the solo violin at 6.44 - one of a myriad small foundation details. Pohjola's Daughter is built at first very rigidly but then (very soon) comes that sense of plasticity and release (at 2.30). Note orchestral surge at 3.10. central section detrimentally broad. Whiped action at close and coal black edge to brass barks. Tape splice at c 8.25. Otherwise full of finely judged utterly masculine touches. The austere Bard is given a performance pointing up its links with the Sixth symphony. Lemminkainen's Homecoming is given the best performance I have heard. This is a real hell-for leather cartwheeling dash. The sound quality is the best of all the tracks on this disc. At least one little regarded aspect of Boult's character seems to come over. Boult the irascible martinet comes across in the fiery impetuosity which especially informs Tapiola but which can be felt in all the tone poems. The Oceanides (the sea nymphs) is declared by Sibelius to have Mediterranean rather than Nordic roots. We know that Sibelius (and other Nordic composers: e.g. Petersen-Berger and Gösta Nystroem) was greatly drawn to Italy. His second symphony was written there as was Tapiola (of all works!) and Nightride and Sunrise. Nightride is driven faster than I have ever heard it. In fact you fear for articulation although the orchestra does marvellously as they are pushed right to the edge of their seats. Towards the end that great burst of energy seems to dissipate and a more languid air pervades the music. The other pieces on this disc display the same qualities as the rest: grave, impetuous, intemperate. The performance of The Tempest prelude is especially impressive (for a while it served as a filler to one of Boult's Pye LPs of The Planets) drawing obvious parallels with the string-goaded storm of Tapiola. Finlandia is both grim and modestly stirring though tending towards languor - no match for the recently reviewed Barbirolli EMI version or the Stein on Decca. While this set is important for Sibelians the mono sound is bound to be a disincentive to some. The sound, intrinsically, is not as solid and vivid as the mono set (of symphonies and a selection of tone poems) from Beulah (LSO/Collins - originally Decca) sometimes seeming as if a super-fine gauze hangs between the players and our ears at others lacking that satisfying squat impact you find in the best mono recordings. The outlay at bargain price however is not great and anyone with a strong interest in Sibelius will want these recordings in their library. They provoke both affection and surprise: a good test for any performance of a piece of music. All these recordings were once available on Pye LPs and (if I recall correctly) briefly on NIXA CDs in the late 1980s. Regrettably the pauses between tracks are quite inadequate. This is especially noticeable in the first volume. The recordings were made about eighteen months before Sibelius's death in November 1957.
and very much to Sibelius's (and our) advantage.